The film boasts an all-star cast, and is co-produced by Oscar nominee Anne Archer. The excellent character actor Michael Nouri, the steady Christopher McDonald and the very funny Katherine LaNasa are joining forces with newcomers Jeremy Sumpter and Jillian Murray. The odyssey of a young hot prospect and two gambling legends – based on a true story – are teed up to create a viable comedy about colorful characters, the essence of the links and who-will-outdo-who on the fairway and in the rough of life. Katherine LaNasa was key in the Will Ferrell/Zach Galifianakis comedy “The Campaign,” and was once married to Dennis Hopper. Michael Nouri will forever be remembered for “Flashdance” (1980), but also shined in“The Hidden” (1987) and has had a stellar career as a character actor, with notable roles as Joe DiMaggio in Billy Crystal’s “61*” (2001) and the recent “The Slap” TV mini-series. “The Squeeze” had a limited theatrical release on April 17th, and was also available starting that day via Video-On-Demand. HollywoodChicago.com: Anne, this is your third producer project, but your first in several years. What motivated your participation with your husband [Terry Jastrow] to get this film into production? 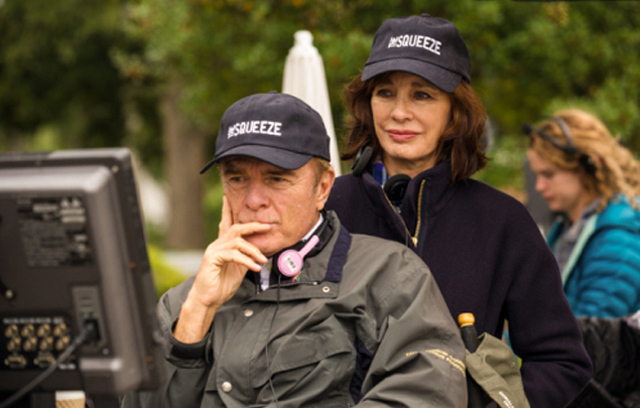 Anne Archer: Terry and I produced when we first got married, and we both starred in. So this is my second film with him, and I’m also involved in two upcoming projects. For ‘The Squeeze,’ Terry and I were at a dinner party one night, and we were told this incredible story from a guest about when he was a young kid in Texas, and an exceptional golfer. A big time gambler, traveling from Mississippi to Las Vegas, heard about him breaking the course record at a municipal tournament, and took an interest in using him for gaming and golf. Terry Jastrow: It’s all true, that’s what is so amazing about it. HollywoodChicago.com: Well, Terry, you have been involved with golf throughout your career, as a sports producer and director. What element of the game lends itself best to a fictional movie – the personalities that surround it or the game itself? Jastrow: The first part of the answer to that question is that golf is played alone. The second thing about the game is that you can get yourself in a bad spot very quickly. At that time, the game suddenly has less to do with the physical component, and all to do with the mental element. You don’t so much choke if you know your mechanics, you choke from the mind and the heart. That is ‘The Squeeze’ that our young main character gets caught into, between the two gamblers. HollywoodChicago.com: Since you created the character of Augie in the film, what do you see the most about yourself in his character, and how did that help you steer Jeremy Sumpter’s performance as Augie? Jastrow: I did, like Augie, grow up in a small town in Texas. There is kind of a humble naivete that exists in that atmosphere, coupled with a belief in the possibilities of things and the achievement of dreams. It may be unrealistic to outsiders, but it’s very real. I love that kind of simplicity and sweetness, as was contrasted against the potential evil of the Riverboat and Jimmy Diamonds characters. That part of small town life propelled Augie – and the collision of that sweetness against the evil is what creates the drama. HollywoodChicago.com: Katherine, what type of woman in your life that have you observed that best fits your character of Jesse in the film, a sort of a good luck charm as much as a companion to Riverboat? Katherine LaNasa: She is a mix of a bunch of people. I grew up in the deep South, in Louisiana and Mississippi. I had an uncle named Red, and his wife was named Winkie, and although they weren’t the characters in the film, they were the colorful types that I remember. It was Winkie’s gowns and hats that I borrowed, and just remembering those larger-than-life Southern friends and relatives. I wanted Jesse to have that throwback look, in honor of those relations from that era. HollywoodChicago.com: Michael, your role as Jimmy Diamond is of a compulsive gambler, who can’t seem to pass up an opportunity to bet – in fact making sure his bet pays off through threats. How did you get through to the character as an actor, and did you take any incidences in your own life? Michael Nouri: Dustin Hoffman once said when he finds a little kernel that is quintessential to the character, he doesn’t worry about anything else. He refers to that one thing. For me, an accent helps, because you really cross a border in the way someone speaks. Or also a prosthetic, a fake nose or a mouthpiece can help. I do what I need to get there. HollywoodChicago.com: Terry, you included a bit of church in the beginning of the film, and some of the characters seem to have a higher power intuition. Were you trying to cast the character of Riverboat [Christopher McDonald] as a sort of Devil type? HollywoodChicago.com: You really emphasized the church part with the tracking shot in the beginning of film, which set the mood. How did get that right? Jastrow: It was our cinematographer Taron Lexton, who is a boy wonder and a young Spielberg, only 27 years old, with a great career ahead of him. HollywoodChicago.com: Anne, it was once said there were three phases to a film actresses career – girlfriend, wife/mother and district attorney. Since you are known for many of the ‘wife’ roles, how did you feel you redefined the clichés often seen with that character? Archer: I don’t know if I redefined anything, because that statement is absolutely correct. [laughs]. There is a point in which you can’t play the sexual love interest anymore, but you still look great, so maybe that is where wife and mother come in. I played those roles when I was fairly young, and I completed the cycle with ‘Boston Public.’ It’s really tough to position yourself as an actress in the business, especially if you’ve never done any character roles. HollywoodChicago.com: Katherine, you broke into performance in your early days as a ballet dancer. How did the use of your body in the art of dance give you an advantage as you broke in as an actor, and how does it inform your range of roles, both dramatic and comedic? LaNasa: I love it when a director uses a wide shot. I did a film with Billy Boy Thornton [‘Jayne Mansfield’s Car’] and there were very few close ups, and it was one of my favorite experiences. In one scene, he wanted me to take off my shoes before I was to go to his room. I decided to take them off in a certain way, from the back. It was the way that I took them off when doing ballet. In general, it gives me a lot of body awareness, and allows for physical choices that add to the character. Jastrow: In addition, in our film we were waiting to do a scene, and Katherine was doing yoga stretches, and thought let’s just shoot that. We opened the scene with her doing those movements. LaNasa: It was actually in the script, it said ‘Jesse warms up doing stretches.’ I thought to myself, Terry doesn’t realize who he gave that action to, so I went for it. HollywoodChicago.com: Michael, you’ve worked with a range of directors. Which of your early directors really influence the way you think about performance? Everything just collapsed inside of me, I was horrified. It’s a wonder that I ever acted again, but I got over it. Years after that, I was auditioning for Larry, and the first thing he said to me when I walked into his office was, ‘so, have you learned to act yet?’ And I said back, ‘yes, and thanks to you I have a wonderful therapist.’ [laughs] So that was definitely a director influence. HollywoodChicago.com: Anne, we saw author Raymond Carver emerge again for the Oscar winning film ‘Birdman’. Since you were so memorable in ‘Short Cuts,’ what do you think Carver knew about human nature that no other American author knew, and did you feel it again when you saw ‘Birdman’? Archer: I loved that film, and I love Raymond Carver. I think what he knows is the dark side of humanity, the dark side of the soul, the side that they never show to anybody else. He does it in such a subtle way, so that it doesn’t come out as just evil, as much as exposing the dark underbelly of everybody’s experience. It’s very thoughtful as a dark side. Robert Altman’s method in ‘Short Cuts’ was to direct me by asking questions. ‘What do you think her voice would sound like?,’ for example, and then he would leave me alone. He’s very much into improvisation. He liked the way in one scene I drank whiskey, because he observed the things that I did, and then he encouraged the character actions that he really liked. HollywoodChicago.com: Michael, you had two significant baseball roles in your career, in the underrated Bay City Blues and then the spectacular cameo as Joe DiMaggio in the HBO movie ‘61*.’ Since a new season is almost upon us, in what way do you think baseball is a metaphor for life? Nouri: It’s a metaphor in a way that if you don’t understand the game, it’s boring. If you do understand the game, it’s endlessly fascinating. Baseball and life are both like that. In 1956 my Uncle Edgar took me to the World Series at Yankee Stadium. I finally turned to him and said, ‘Uncle Edgar, nothing is happening.’ He then told me, ‘Michael, history is happening. That pitcher Don Larsen is throwing a perfect game.’ Yes, I was at that historic game, but for me it was so boring because I didn’t understand it fully at the time. Nouri: I got the call to do the role when I was on a plane, traveling for the Fourth of July weekend. On the other end of the call, I heard ‘…where are you, Billy Crystal [the director of ‘61*’] wants to meet with you.’ The plane was taxi-ing, and the next plea was, ‘can you get off the plane?’ [laughs] That’s when I was told me they wanted me for Joe DiMaggio. Anyway it worked out, and I didn’t have to get off the plane. When I finally did see Billy, I didn’t have to audition. He just gave me a bunch of material and footage to study. HollywoodChicago.com: Anne, since you worked a lot in the Golden Age of 1970s television, what is the weirdest kind of coincidence you came across from the early days that came back during your subsequent film career? Archer: I may sound like a snob, but I don’t remember my work in the Golden Age of Television. [laughs] One of my first jobs was a terrific feature film with Jon Voight [The All-American Boy’], which was a huge role but a big flop. but I did learn a lot on that set. I did some television around that time, but I don’t remember anybody that I encountered that I saw later when I was doing feature films. HollywoodChicago.com: Katherine, your first marriage was to Dennis Hopper when you were very young. Since you had a child together, had your relationship come to a good place near to when he passed away, and were you able to get some closure with him? LaNasa: Yes, I was very close to him when he was sick, and was with him when he died. I spent a lot of time with him as it was happening, and it was very transformative for me. Sometimes life gives you difficult opportunities, but those instances are the way you find out who you are, and what you’re made of…and I was very afraid of his illness, but being there was a healthy presence. It gave me a lot of closure, and it really helped my son. Dennis gave me something as well, he was more of a father figure to me. I think I always wanted to stay close to him. Being with him when he passed was a gift for me. HollywoodChicago.com: Terry, since this is your directorial debut, what are your director influences, and how did you honor that influence in ‘The Squeeze’? Jastrow: At the end of my career at ABC-TV, I studied with Lee Strasberg for seven years, and the potential of an actor fascinated me. They are amazing and magical creatures, and we’re sitting with three of the best I’ve ever known. And what I learned from them was to create an environment where they can be at their best. Get out of the way and let them be great. They’re doing their art, and the director should basically get the f**k out of the way.